Opting out is in. 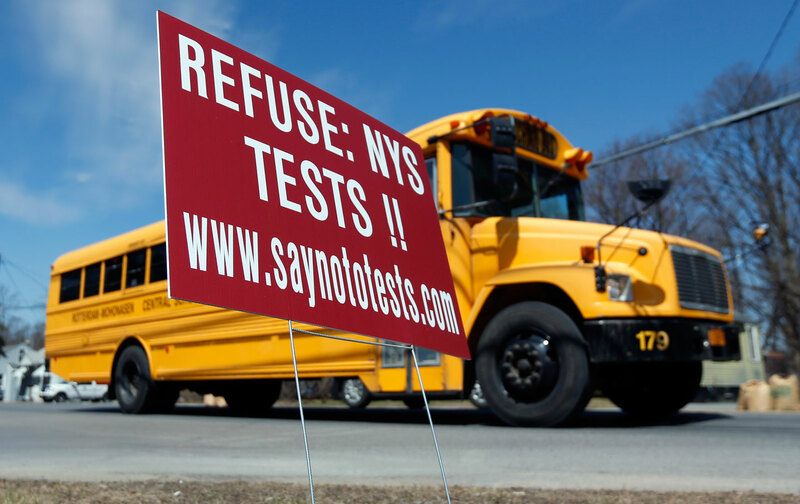 Over the past two years, the movement to boycott standardized tests across New York State has mushroomed from a fringe rebellion to a mass mobilization against what many see as an anxiety-provoking, creativity-stifling, and hypercommercialized testing regime. With record numbers of opt-outs last year, however, activists are now testing the patience of education officials. State education Commissioner MaryEllen Elia has signaled stiff disapproval and dropped hints last month that the movement may suffer consequences for bucking the system. Although the standardized tests at issue, for English and math skills in grades three through eight, are essentially voluntary, administrators are required to offer them. Moreover, some federal funds are in theory contingent on achieving near-total participation rates. Yet as opt-out campaigns have emerged in communities around the country, parents seem increasingly confident in their right to noncompliance. Officials and education authorities have largely refrained from intervening. Some, such as Delaware and Colorado, have even developed policies either promoting reduced use of tests or clarifying parents’ right to reject them. Elia is leaning in the other direction. She explained to Politico she was currently assembling a legal “tool kit” to help superintendents “communicate in a much more effective way to people across the state,” presumably to equip administrators to pressure students while avoiding liability for outright threats. But after several weeks of public criticism and confusion, state education officials announced that there would not be any loss of Title I school funding. They did not rule out the possibility in the future, and federal officials are reportedly still considering whether to intervene. Jia Lee, a New York City-based special education teacher with the Movement of Rank-and-file Educators caucus of the teachers union (MORE-UFT), sees political designs in Elia’s warnings. She is “in essence implying by her threats,” Lee says via e-mail, that parents’ choice to opt out “will have negative consequences for schools. More specifically, poor children of color are the targets. Since Title I schools are disproportionately Black and Latino.” Ironically, many of the communities with the highest opt-out prevalence, including several suburban Long Island districts, were mostly white and relatively affluent. So if funding consequences were imposed, wealthier high opt-out communities might suffer little in any case, while communities of color would have more to lose for opting out. Although individual opt-out students might escape punishment, the exams are not inconsequential. The results feed into the development of standards and programs such as the Common Core, which serve as benchmarks for evaluating students; the data is also central to teacher assessment. Reforms passed earlier this year in New York weight professional evaluations even more heavily on test results. But mass opt-outs might upend the process if there are not enough data collected to draw any meaningful analysis or district-wide comparison of trends in scores. That’s okay by many teachers. Progressive educators and teachers unions have rallied around opt-out in their increasingly militant resistance to corporate-style education reforms: anti-testing civil disobedience is a symbolic challenge to the ideology of “accountability”-based school policies, from rigid curriculum mandates to expansion of charter schools. But her recriminations might reveal more about her political role than about the true value of the exams; the opt-out explosion threatens to deprive the testing machine of the data it relies on to validate and legitimize its existence. The chief consequence of opt-out, in fact, is that massive noncompliance in school communities expose the hollowness of the testing system. That’s the real political calculation behind the tests. They don’t assess skills or teacher “effectiveness” so much as they measure conformity and the establishment’s power. Students, families, and educators are learning fast that whatever they put on the answer sheet, it all adds up to zero.